Must one check the strings and separate the Tzitzis prior to wearing it? May one wear a small Tallis [shawl] which only covers the head or neck? One does not fulfill the Mitzvah of Tzitzis by wearing the Tallis in such a way, as explained above in Halacha A. Checking and separating the Tzitzis prior to wearing: See Chapter 2 Halacha 5-6! Standing while putting on the Tallis: See Chapter 2 Halacha 8! How to do the wrap: The Yishmaeli wrapping is performed in the following method: [After the Tallis hangs from behind] one lifts the top and bottom corner of the right side of the Tallis in one’s right hand and wraps it around one’s neck towards his left. The fringes of the right side are to rest behind ones neck/shoulder of the left hand side. [Many Chabad Chassidim are accustomed, as was the Rebbe Rashab, to even out both sides of the Tallis prior to swinging the right Tzitzis over the neck. The widespread Chabad custom today is to grab the actual corners with the right hand, and then swing the Tzitzis over the shoulder. However in the tradition of Reb Shilem one swings the entire right fold over the shoulder, and not just the Tzitzis. Whatever the case, it is inappropriate to throw the Tallis over one’s entire head in a way that it prevents him from seeing, as explained below.] The two corners of the left hand side remain in front of him [by the left hand side], in the direction of the face. [The widespread Chabad custom today is to lift the two corners of the left hand side with the left hand and then proximate the Tzitzis near the chest. However, according to the tradition of Reb Shilem, as is implied from the Halachic sources, one is to leave the left Tzitzis hanging on the front left side, pointing slightly to the right, without lifting it. See Picture 5!] Thus in total, all four corners of Tzitzis are on the left side, the two of his left side by his front left, and the two of his right side by his back left. The material of the Tallis must cover his front and back until [below] his chest [for a total of one Ama on each side]. If the Tallis does not cover his body, and simply covers his neck, according to all it is not considered the Yishmaeli wrap at all and does not contain any Mitzvah according to any opinion. The [upper edge of the Tallis, which covers one’s head during the blessing] does not need to cover one’s face up until below one’s mouth. However it is to cover one’s face until slight below one’s eyes. [However it is inappropriate for the Tallis to cover one’s eyes in a way that it prevents him from seeing.] One is to stand in this position of wrapping for the period of time it takes to walk four Amos and he is then to wear the Tallis according to the community custom. The statement of Mah Yakar: After the blessing, while one is still wrapped in the above form of Yishmaeli wrap, one is to recite the verses of “Mah Yakar Chasdech…” [Tehillim 36:8-11] as printed in the Siddur. 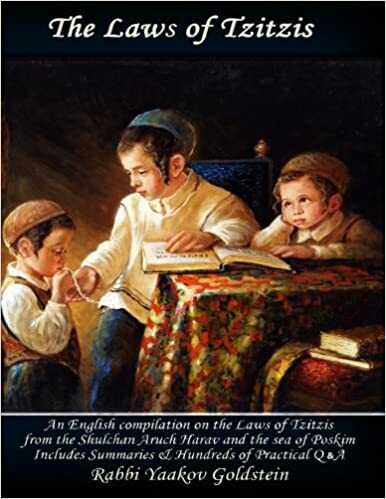 Miscellaneous laws relating to the blessing over a Tallis Gadol: See Chapter 2 Halacha 2! The folded Tallis Gadol is placed on the right shoulder, and one checks and separates its Tzitzis while reciting the two verses beginning, Barchi Nafshi. The Tallis is then unfolded and opened wide; one kisses its upper edge, and it is swung around from the position in which it is held in front of the person until it is hanging behind him. The upper edge of the Tallis is placed on one’s head and is stretched forward over one’s face until it loosely covers the eyes. At this point, the blessing is slowly begun and is only completed at the end of the wrapping when one is about to bring the two right hand corners of the Tallis in front of the neck and over the left shoulder, as explained in the next steps. Many Chabad Chassidim are accustomed to even out both sides of the Tallis prior to swinging the right Tzitzis over the neck. One lifts the top and bottom corner of the right side of the Tallis in one’s right hand and wraps it around one’s neck towards his left. The fringes of the right side are to rest behind ones neck/shoulder of the left hand side. [The widespread Chabad custom today is to grab the actual corners with the right hand, and swing the Tzitzis over the shoulder. However in the tradition of Reb Shilem and the Rebbe Rashab one evens out the sides of the Tallis prior to swinging it over the neck, and then swings the entire right side over the shoulder, and not just the Tzitzis.] It is inappropriate however to throw the Tallis over one’s entire head in a way that it prevents one from seeing. The material of the Tallis must cover one’s front and back until below his chest for a total of one Ama on each side. There however is no need to draw its upper edge so far forward over one’s head that it will cover the face down to the mouth; rather, only far enough to cover the eyes. One is to stand in this position of wrapping for the period of time it takes to walk four Amos. May one speak during the wrapping? It is forbidden to speak, or even answer for Kaddish or Kedusha, until the blessing and the wrapping is complete. Once the wrapping is complete [step 7 above] one may talk. Due to this, one is not to begin saying the statement of Mah Yakar until the wrapping is complete [step 7]. How long is one to stand in the wrapped position? What is the definition of four Amos? How is a lefty to wrap the Tallis? In the same method and directions as a right handed person. Is one to perform the Yishmaeli wrap each time he wears the Tallis Gadol, even if it is the same day? Each time that one recites a blessing over the Tallis Gadol he is to perform the Yishmaeli wrap. C. How should the Tallis Gadol be worn during prayer, after the blessing? The custom today: The Chabad custom [as well as the custom today in most communities] is to place the sides of the Tallis on ones shoulder in order to have the Tzitzis strings of the right and left corner of the Tallis hang on both ones front and back. This is done in order so one has two sets of Tzitzis by ones front side, and two sets of Tzitzis by ones back side, in order to be surrounded in Mitzvos. No matter which custom one follows, one must beware that the Tallis covers his body properly, which is one Ama of his back. Those who role the Tallis in a way that it does not cover an Ama in width of the back do not fulfill the Mitzvah. It is the custom of those particular in Mitzvos, and of all the Chassidim, to cover their head with the Tallis Gadol throughout the entire period of time that they are wearing it, in order so their head is not uncovered for even one moment. Doing so humbles ones heart and leads to fear of heaven. One who removes his Tallis from his head is like one who passes over the chance to perform a Mitzvah. One is not to uncover his head from the Tallis even if he is very hot. The Tallis is to remain on one’s head from the beginning of Davening until the end. Is the Tallis to also cover the head Tefillin during Davening? How much of the body must the Tallis Katan cover? The Tallis Katan does not have to be large enough to cover the body in the form of a Yishmaeli wrap. The Tallis Katan must be worn in a way that the width of the Tallis covers at least one Ama [49 cm] of the body, and the length of the Tallis covers at least two Amos [98 cm] of the body, [one Ama in front and one Ama in back]. The folded areas of the Tallis are not included in the above size. Thus, all those which are careful to fulfill the Mitzvah of Tzitzis the entire day must be careful to constantly beware and supervise that at least one Ama of the width and length of the Tallis Katan is spread open and not folded [in both the front and back]. Due to this requirement, those that manufacture the Tallis Katan are to beware to make the width of the Tallis a littler wider than the minimum width of one Ama, as it is difficult to achieve that the entire width of the Tallis remain flatly opened and not contain any folds. 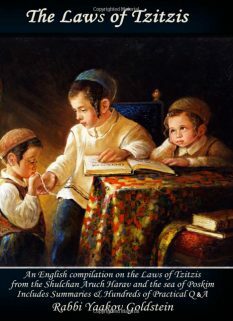 The laws of reciting a blessing over a Tallis Katan: See Chapter 2 Halacha 3! The Tallis Katan is worn in a way that it covers at least 49 cm by 49 cm of one’s front and 49 cm by 49 cm of one’s back. It is to cover the chest. We do not perform the Yishmaeli wrap when wearing a Tallis Katan, and hence the blessing of Al Mitzvas Tzitzis is recited upon wearing it. Why do some Chassidim wear a bindle over their Tallis Katan? This is done in order to prevent the Tallis from folding over and losing the measurement of an Ama in width. This is especially pertinent when sleeping at night with a Tallis Katan, in order to ensure that the Tallis remains spread open even when one turns in his sleep. May one fold his top half of the Tzitzis over his neck while playing ball? Based on the above ruling in the Siddur, one may not do so, as by doing so he loses the Shiur of the Tallis. If one wears a V-Neck Tallis Katan, does the area where it is cut count within the measurement that is required to cover the body? Any area of the body that is not actually covered by the Tallis is not included in the required measurement of covering. Thus, if the V area of the Tallis Katan is folded, all that area is considered not covered and it may jeopardize having a 1×1 Ama covered area on one’s front side of his body. Perhaps this is an additional reason for why according to Chabad custom we do not wear V neck Tallis Katan. In the event that one purchased a V neck Tallis Katan and he desires to be careful in this matter, he can sew the edges of the V neck, hence leaving only the neck hole open, as brought above from Admur in the Siddur. The Tzitzis of a Tallis Gadol/Katan is to be tied to the corner in a way that a) the first knot rests 4 cm above the corner, and b) the Tzitzis hits the corner when it is worn, and does not hover over the ground. Due to this, one must beware upon tying the Tzitzis to the corner, to tie it in accordance to the way one wears the Tallis, in the way that will assure that the braid hits the corner and does not dangle straight over the ground when he wears it. By a two hole Tallis Katan this is automatically accomplished by tying the first knots onto the two holes. In order to accomplish this by a single hole Tallis one must tie the first knot of the Tzitzis very tight on the side of the corner, hence preventing the knot from falling below the 4cm mark. The Chabad custom by the Tallis Gadol is to make a side hole into which the Shamash is fastened after making the two knots, hence preventing the knots from falling below the 4 cm mark. See Chapter 3 Halacha 12G and Chapter 4 Halacha 10A for the full details of this subject! In a time of need: In a pressing situation, such as one who is walking amongst gentiles and fears being scoffed, may tuck the Tzitzis in his pockets. However, at the time of the blessing the Tzitzis are to be revealed for the amount of time it takes to walk four Amos. The Chabad custom is to wear the Tallis Katan under the shirt, but over the undershirt, and to have the Tzitzis stick out. One may not swerve from their custom of wearing the Tzitzis out, to begin wearing their Tzitzis tucked inside. One is to constantly look at his Tzitzis throughout the day. Doing so is a great source of assistance to the soul to prevent it from sin. There is a tradition amongst meticulous Jews that even when they were sitting idle they would constantly touch the Tzitzis and look at them. May one wear a Tallis Katan on his actual skin, or must he wear an undershirt under it? There is no prohibition against wearing a Tallis Katan on one’s actual skin. Nevertheless, the Arizal was accustomed to wear the Tallis Katan over the undershirt, and so is the widespread custom amongst Chassidim. G. May one wear a Tallis upside down, with its top part on the bottom? Does the above law apply to a Tallis Katan? Some say the above law applies likewise to a Tallis Katan, and hence they make a sign on the front part of the Tallis Katan in order so it is not worn in the opposite order. If the top of the Tallis has torn, may one permanently switch sides of the Tallis? H. May one wear a Tallis inside out? I. May one wear a folded Tallis? Every person must beware not to wear a folded Tallis. Thus even a Tallis that is very long and is the length of two Talleisim is not to be folded and worn in this method. See Chapter 3 Halacha 11C for the full details of this subject! M”A 8/2; Masas Binyamin 48; Poskim in Kaf Hachaim 8/9; See Nehar Mitrayim 1 which says that most Egyptian Jews wear the Tallis this way and they are to be taught to wear it properly, at least for the time of the blessing. 8/5-6; The idea of a Yishmaeli wrap is first mentioned in Moed Katan 24a regarding a mourner. It is disputed as to whether this concept is relevant also to the wearing of a Tallis. So is implied from Admur ibid that the head must be covered according to all [at least during the blessing] and the dispute is only regarding whether it must be covered in a Yishmaeli wrap and so proves Radbaz 1/143 that the head must be covered from the above wording of Admur which is based on the Tur and also from the fact the Nussach of the blessing is Lihisatef Betzitzis. However Tzaruch Iyun from Chayeh Adam 12/4 that one is Yotzei Bedieved even if he said Lihisatef on a Tallis Katan, and that he may do so even Lechatchila, even if he does not do Atifas Yishmaeilim. The Shaareiy Teshuvah 8/3 writes “If one does not cover the head when wearing the Tallis by the blessing, he has not fulfilled the blessing.” However seemingly he is referring to the case of the Maasas Binyamin, in which only the shoulders are covered and not the bod. Ruling of the Siddur: In the Siddur Admur explains that it is proper to wear the Tallis throughout the prayer in a way that the left part of its length is by ones back while the right part by ones front. This is the custom of the Arizal and is also recommended in accordance to the revealed aspects of Torah. The reason: As the main care of the first opinion is that one should wear the Tallis in a Yishmaeli wrap at least initially upon wearing it [and saying the blessing] as even according to their opinion one can remove the Tallis altogether after the blessing is recited after the initial wearing. [Admur ibid] This implies that in truth, according to the first opinion, when one undoes the Yishmaeli wrapping he ceases to fulfill the Mitzvah. Admur 8/2; Elya Raba 8/1; See also Levush 8/1; Taz 643/2; implication of Michaber 8/1; Poskim in Piskeiy Teshuvos 8 footnote 46 that one at least begins the wrapping before the blessing. Ruling of Admur in Siddur-Before begin to wrap: In the Siddur [letter 24 in Raskin] Admur states “Prior to beginning to wrap one is to say the blessing” and [in letter 12] “Immediately after the blessing of Lehisatef one is to be wrapped”. Hence while in the Shulchan Aruch Admur rules to first begin the wrap before the blessing, in the Siddur he rules to do the entire blessing before even beginning the wrap, as rule the other Poskim listed below. Our custom in Sefer Haminhagim seemingly follows both opinions, as we begin the blessing before the wrap and continue it throughout the wrapping. When is the beginning of the wrap? See Sheiris Yehuda 1 and Piskeiy Teshuvos 8 footnote 43 for the meaning of this statement, and if it means to say the blessing while the Tallis is by one’s back, as is the Chabad custom to begin the blessing at that time, or if it means while it is already being wrapped, but just not like Atifa Yishmaeli with the Tzitzis thrown behind ones back, or prior to holding the Tzitzis in ones hands after the wrap is complete [as rules Taz ibid]. Previous Chabad tradition: In previous times, the Chabad custom was to place the Tallis over the head from in front and then recite the entire blessing, and only afterwards was the Atifa performed. [Siddur Admur; Divrei Nechemia 9; Custom of Rebbe Rashab as heard from Rav Eliyahu Landa Shlita, in name of the Ishkavta Derebbe]. Ruling of Shulchan Aruch: See Michaber 8/4; Admur 8/10 which implies that during the Atifa all 4 strings were in front of him, and hence they write after the Atifa “One is to return two strings in front and two in back” However according to the Siddur even during the Atifa this is fulfilled. Aside for being the custom of the Rebbe Rashab this custom is also the tradition handed from Reb Shilem; In the illustrations of the Chabad custom brought in Taamei Haminhagim [p. 612; Eshkol-Rav Weinfeld publishing] it states that one is to even the sides, as done by the Rebbe Rashab, although it does not mention swinging the entire right side of the Tallis over the shoulder. He writes there that the Rebbe reviewed some of these illustrations. So can be implied from the wording in Siddur 12 “one lifts the also the bottom corner of the right side” that only the corners are grabbed, and so is explicitly stated in the source of this ruling in Arizal [Peri Eitz Chaim Shaar Hatzitzis 3] “One is to bind the two right Tzitzis and throws them over the left shoulder”. See also Hayom Yom 5th Elul “The blessing concludes in proximity to the binding of the two right corners around the neck, towards the back of the left side.” However in Siddur 25 he writes “One is to bind the Tallis together with the two corners of the right side around the neck and then place it over the back left side” These extra words of “bind the Tallis” is not recorded in the Arizal and perhaps comes to hint to the tradition of Reb Shilem, to throw the entire right side over the shoulder. See the tradition of Reb Shilem recorded at the end of this Halacha that the entire even right side is then thrown over the left shoulder. See previous footnote for a source for this in Admur. In the illustrations of the Chabad custom brought in Taamei Haminhagim [p. 612; Eshkol-Rav Weinfeld publishing] it states that one is to even the sides, as done by the Rebbe Rashab, although it does not mention swinging the entire right side of the Tallis over. 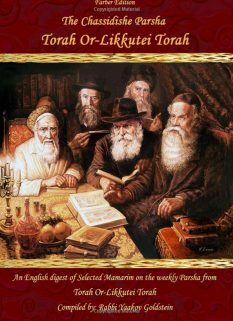 He writes there that the Rebbe reviewed some of these illustrations. Covering the face with the Tallis: Regarding if the right side which is thrown over the shoulder should also cover part of the face, some Poskim write that it should be wrapped in a way that it covers one’s beard and chin, up until one’s mouth. [Ketzos Hashulchan 7 footnote 14, in explanation of Admur 8/5; Piskeiy Teshuvos 8/7 and footnote 69 based on Yoreh Deah 386] However see Hiskashrus 543 that this explanation does not fit into the wording of Admur which implies that the Tallis is to cover up until the eyes/mouth from the top part of the Tallis and not from the side or bottom. Furthermore, even the Ketzos Hashulchan ibid concludes that according to Admur in the Siddur this is not necessary. Is one to lift the Tzitzis of the left side and place it near his face? Many Chassidim are accustomed to take the corners/Tzitzis of the left hand side of the Tallis with their left hand and then proximate their left hand with the left Tzitzis to their left shoulder area. It does not state explicitly anywhere in the instructions of Atifa that one is to lift the two left corner Tzitzis with his left hand and proximate it to his chest, neither in Siddur Admur [12 or 25], Sefer Haminhagim, Kisvei Arizal, or other sources recorded in Kaf Hachaim 8/9, and rather it simply states that the left side is to be “by the side of the face”. Furthermore, in the writings of the Arizal ibid, which is the source of Admur’s ruling here in the Siddur, it says explicitly that the left side of the Tallis is to “remain in the direction of the face” which means that it is not moved or changed from its position that it was in when one first placed the Tallis over one’s back and over the head. 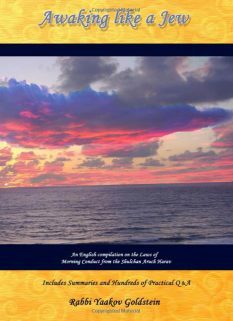 However in the illustrations of the Chabad custom brought in Taamei Haminhagim [p. 612; Eshkol-Rav Weinfeld publishing] it states that this is to be done. He writes there that the Rebbe reviewed some of these illustrations. In the tradition received from Reb Shilem [brought below] one does not lift up the sides of the left corners of the Tallis at all, and rather leaves it hanging in its current state. Furthermore, lifting the left corners is detrimental to the wrapping as it causes that the left side no longer properly covers the body, and Admur rules that it must cover one Ama on the front side. [Heard from Rav Eliyahu Landa Shlita] However despite the above, we do find later on in the Siddur the following statement which seems to describe the above custom “Therefore by the Talleisim that are not very long, it is not possible to lift also the bottom left corner that it be in front of him, on the chest or near the chest, for the time of walking 4 Amos, as written in certain writings of the Arizal.” Thus we see a clear reference in the Siddur to the widespread Chabad custom today. Vetzaruch Iyun Gadol why Admur did not write this explicitly in the instructions of the Siddur in 25, as well Tzaruch Iyun as to the source in the Arizal, as we do not know of anywhere that the Arizal mentions to lift the left corners. All in all, despite there being no clear source for this custom, many Chassidim do so, and lift the left corners in the left hand and place it by their left shoulder as explained above. Perhaps this is because this is the most practical way of assuring that the two left corners remain in front of the body and do not slip towards one’s back. [Heard from Rav Shalom Dovber Levin] To note however, that those who follow the tradition of Reb Shilem in which the Tallis is evened on both sides it will never slip towards one’s back and hence the lifting of the corners is not needed for any reason, and on the contrary is just detrimental, and hence should not be done. [Rav Eliyahu Landa Shlita]. Other opinions: Some learn that according to the Arizal the wrapping is to be done only around the neck and not around the body. [Ben Ish Chaiy Bereishis 5; Chesed Lealafim 8/2] Admur in the Siddur and the Kaf Hachaim ibid negate this opinion. Rebbe Shilem, who was the head Mashpia of Tomchei Temimim in Lubavitch in the years 1912 until his passing, taught the students of the Yeshiva the following order of wrapping the Tallis Gadol. So was taught by Reb Shilem to Rav Yaakov Landa OBM, and Rav Shlomo Chaim Kesselman OBM, amongst other great Chassidim. They in turn taught it to Rav Eliyahu Landa Shlita. The tradition recorded here was heard and demonstrated by Harav Eliyahu Landa in their name. This order does not differ from the ruling of Admur in the Siddur but simply adds a few important points that are to be followed in order to properly perform the wrap described in Admur, even though these steps are not explicitly mentioned in the Siddur of Admur. In the second part of the Siddur that this is mentioned  Admur states a first option which implies that both right corners are thrown over the left side. Admur then concludes “It is better to throw one corner of the right side over the left shoulder, towards his back, thus being completely wrapped by the Tallis, similar to the Yishmaeli wrap.” In the first part of Admur  only this last method is mentioned. Covering an Ama of the front: Admur in the Siddur mentions the custom of today in which we roll the sides of the Tallis, and it does not cover an Ama in front and it is due to this reason that he writes that it is better even according to Nigleh to perform the Kabalistic custom mentioned above. Vetzaruch Iyun Gadol why we are not accustomed to cover an Ama in the front of the body, despite Admur explicitly requiring also the front to be covered an Ama, as explained in A from the Siddur]. The reason: As the verse states “Asher Tichaseh Bah”. This teaches us that the above required measurement must cover the person and may not be folded or dented in any amount. [Siddur Admur; Tehila Ledavid 16/2] However see Tehila Ledavid ibid who questions this understanding, being that those words come to include the clothing of a blind person. He concludes with a Tzaruch Iyun. See Siddur Raskin Miuim 3! Ruling of Admur in Siddur: In the Siddur Admur omits the blessing of Al Mitzvas Tzitzis which can lead one to learn that he rules like the Michaber, that this blessing is not to be recited. Admur ibid; Siddur ibid; So was the custom of Arizal brought in Shaar Hakavanos Tzitzis 6, Kaf Hachaim 8/27; Admur in 8/7 and the Siddur explains exactly how to do this with the Tallis Katan. Other opinions: This blessing is omitted in Siddur Admur and Michaber 8/6. Sefer Haminhagim p. 3 [Hebrew]; Hayom Yom 14th Sivan; Eretz Tzvi 1/1; This blessing of “Al Mitzvas Tzitzis” was not originally printed by Admur in the Siddur, and was only added later on in the publishing of Tehilas Hashem, seemingly due to this directive from Hayom Yom. 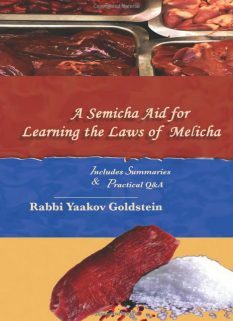 11/34; Siddur Admur; See Chapter 4 Halacha 10A for the full details of this Halacha! 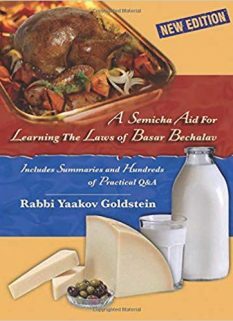 Kneses Hagedola [as understood by Elya Raba 8/14]; Elya Raba ibid [brought in M”B 10/33] writes that if the top part is torn one may wear the top part on bottom. Some have a V-neck opening by the front side of the neck hole; Others have loops on the front side of the Tallis Katan; While others have different materials sewed to the front corners of the Tallis Katan. The Chabad custom: The Chabad Tallis Katan of today has no sign on its back or front. It is interesting to note that Admur ibid changed the wording of the M”A ibid as to the importance of this sign, stating that the Tzitzis which are in front should not be on bottom, hence implying that the main issue is not that the front Tzitzis remain in front but that they should [mainly or also] not descend to the lower part of the body. Now, this is relevant only by a Tallis Gadol, as by a Tallis Katan both the front and back are equal in height. Vetzaruch Iyun! 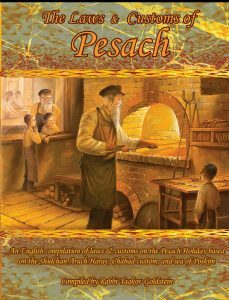 So also rules: Olas Tamid 11/12; Likkutei Maharich in name of Kitzur Shlah; Arizal brought in Shaar Hakavanos Tzitzis 6; Peri Eitz Chaim Tzitzis 1; Nagid Mitzvah. See Aruch Hashulchan 8/10; Piskeiy Teshuvos 8 footnote 123; The reason for this is in order so the right side remains on the right. As by the Tallis Gadol the inner lining is placed on the inner top side of the Tallis, and hence it should not be facing out. Likewise by the Tallis Katan we are particular for it to have two holes.